FMLA FAQ: If an Employee Racks Up Both FMLA and Unexcused Absences, Can He Be Terminated? Here’s a puzzle for you. How would you handle it? I recently had an interesting call with a DOL investigator, and I wanted to share it with you. Hello…hello…hello…is there anybody in there? Just nod if you can hear me. Is there anyone home? Cook County, Illinois (the county in which Chicago is located) currently faces one of the largest budget deficits in its government’s history. So, when the Cook County Board president (Toni Preckwinkle) tells the County Sheriff (Tom Dart) to cut $70 million from his budget, it tends to grab people’s attention. In this story, however, this proposed budget cut took a back seat to a notable statistic that grabbed the headlines: one out of every five employees in the sheriff’s office takes FMLA leave on any given workday. At the Cook County Jail, it’s one in four, as reported by the Chicago Tribune. Before you are left aghast at these figures, allow me to point out a sad fact: the Cook County Sheriff is not alone. In my experience, I find all too many employers that suffer through FMLA absenteeism percentages well above the single digits. 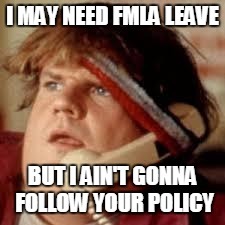 In fact, a new client shared with me that as much as 30% of its workforce is absent on any given workday, the far majority of which is FMLA-related. When I hear of FMLA absenteeism figures as high as these, one thing is abundantly clear: FMLA abuse is rampant in that workplace. Fortunately for employers in this situation, there are several tools available to turn the tide and take back your workplace.